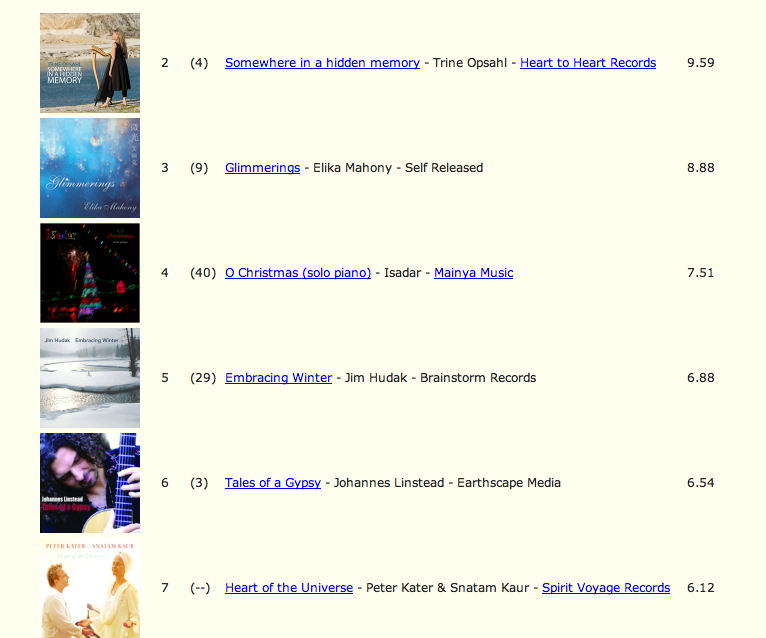 Home » Inspirational » Glimmerings at #3 on ZMR! Glimmerings at #3 on ZMR! I was just informed last night that Glimmerings ranked #3 on the Zone Music Reporter top 100 radio airplay chart for December! ZMR is the industry source for New Age, World, Ambient, Electronic, Solo Piano, Relaxation & Instrumental Music. In November, Glimmerings debuted at #9 after just one month of airplay so I was elated to see it has now moved up to number 3. Glimmerings has also been nominated for the “2012 Album of the Year” and “2012 Instrumental Piano Album of the Year”. For these two awards there will be two rounds of voting. The first round began on January 21 and will continue until February 6th. The voters are the same producers/hosts that report their Top 20 to the ZMR each month for the ZMR Top 100 Monthly Charts, plus a couple of reviewers from ZMR. In the first round of voting each voter will select 5 qualifiers in each category. We will find out on February 10th if Glimmerings qualifies in either of the 2 nominated categories. There will then be a second round of voting for the top 5 albums that qualify and the results will be shared live during the ZMR Live Music Award Show in New Orleans on May 11th. At this point, I’ve been asked to sit tight and see what happens. I must say I’m feeling like the nomination has already been a win for me as I never expected Glimmerings to go so far. Congratulations, Elika! It’s No. 1 on my chart! Congratulations galore!!! What amazing CD that has been well recognized! Very well deserved my love! Such beautiful CD! So happy it is now recognized and out on the market for all to enjoy. So love it! For those in America and elsewhere who are familiar with George Winston, if you like him, you will really enjoy Glimmerings. Of all the music I’ve listened to over the years, none has come close, let alone become equivalent with, my enjoyment of George Winston. In Glimmerings, Elika Mahony has changed that and this CD will become as dear to my heart as so many of George Winston’s works over the past 30 or more years I’ve listened to him. Thank you so much everyone! Glenn – you are so sweet to say that. Means a lot! So happy to learn of the great reception Glimmerings has received! It is a beautiful album, one of my favorites. I concur with Glenn, above. How wonderful that so many people around the world are being inspired by it. Hold Thou My Hand Music Giveaway!